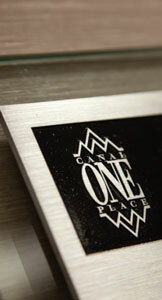 One Canal Place is a 32-story office complex located at the foot of Canal Street, in the heart of the Central Business & Maritime Districts. Completed in 1979, it is among New Orleans’ leading Class A commercial office buildings, with more than 650,000 leasable square feet. With accommodations for single office users up to multi-floor tenants, the facility also offers ample covered parking, a prime location and a list of amenities that makes doing business here a pleasure. And let us not forget the fabulous views of the city that come with every office. 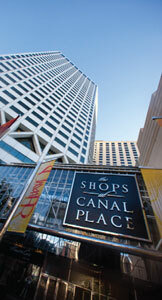 Located in the heart of New Orleans at the center of the International Community, adjacent to the Riverfront. Spaces available from a single office to multi-floor operations, finished to your specifications. Executive level hotel accommodations and dining in the Westin New Orleans Hotel. 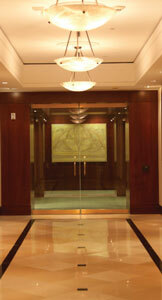 Conference facilities for any size group or special catering via the exceptional Westin staff. Upscale shopping downstairs in The Shops at Canal Place, complete with food court, offering tantalizing treats. Covered loading dock with freight access to each floor. Quick access to interstate systems and public transportation.